The 2016 Scarab 215 jet boat offers lots of choices—and all are fast, maneuverable, and loads of fun to drive. If you’re over the age of 30, there’s a pretty good chance you remember Sonny Crockett and Rico Tubbs speeding around Miami, FL, in a high-performance Scarab 38 KV during episodes of the hit television show Miami Vice. Back in the day, the Scarab name was synonymous with speed, style, and luxurious performance. Today, however, the Scarab line has been re-imagined into a line of high-power, high-performance jet boats. 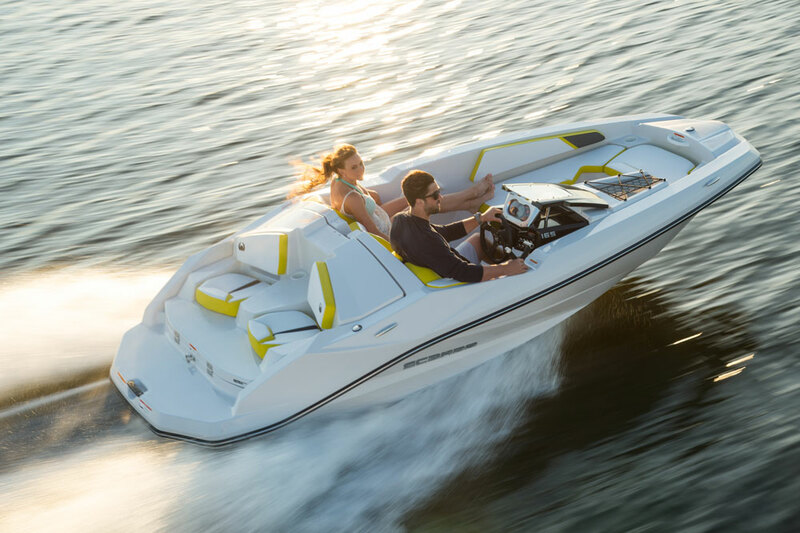 By all accounts, this new line of jets (including boats like the 165 Ghost, the 255 Jet Boat, and the jazzy 195 HO Impulse) has been a success, spurred on by a renaissance in watersports. 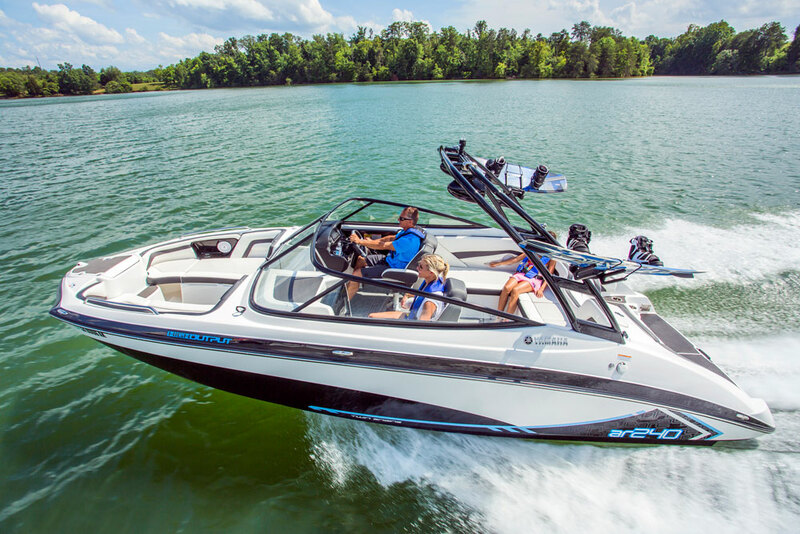 A quick ride on the 215 Wake edition will make it clear why. 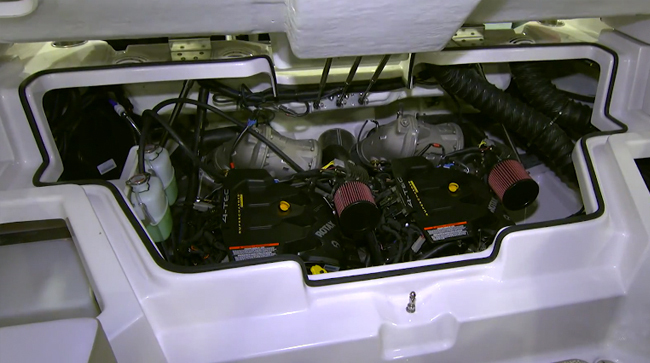 We ran the 215 model recently, which tips in at a base price of just over $41,000. You can get a trailer as an option for just under $1,000, though most dealers order the base 215 with one anyway. Models above the base configuration, such as the 215 H.O. 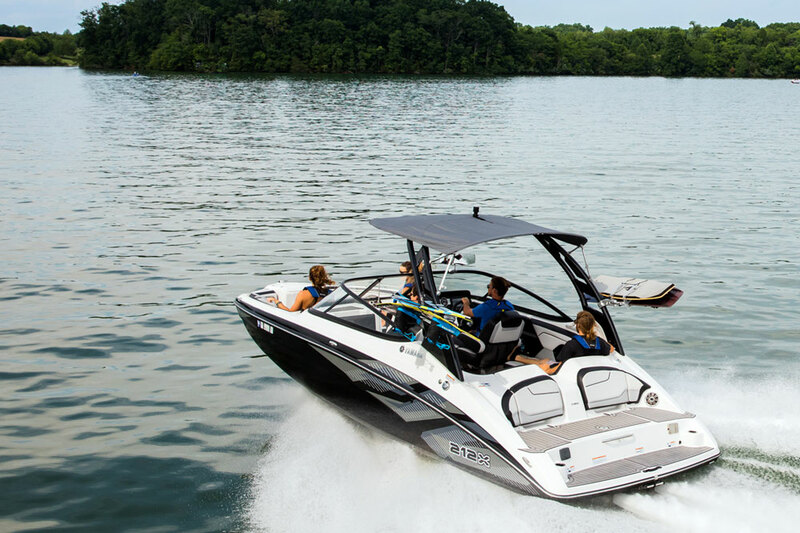 Impulse, add bigger engines and and luxury packages, and the Wake edition is specifically for those watersports enthusiasts. 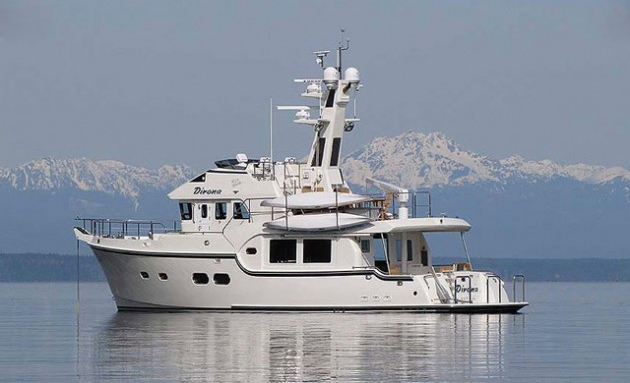 Like its sisterships, the base 215 has an angled, chiseled look that emphasizes its sporty DNA yet still retains a bit of stylish sophistication. 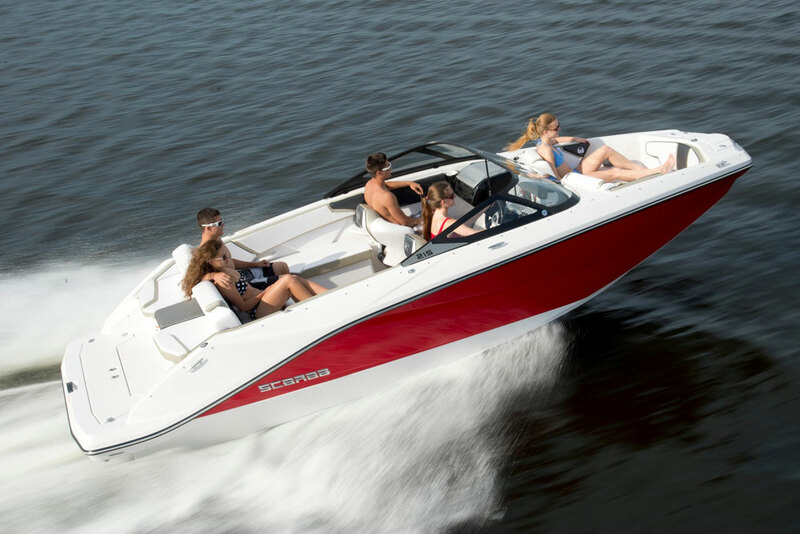 The Scarab 215 is available in four trim levels—base, H.O. Platinum, H.O. Impulse, and Wake edition. The Scarab 215 has a pair of 150 HP four-stroke Rotax gasoline engines under the hood, mated to high-velocity outboard jet nozzles. Like most jet boats, acceleration on the 215 was thrilling, literally pinning us back in our seats for a few seconds as we wound up to speed. The 215 also handled quite nimbly, able to turn and burn in the sharp cornering maneuvers we put it through. At wide-open throttle we ran up to the mid-40s and cruised nicely in the mid 20s. Back at the dock we were reminded that many jet boats are as slippery as an eel in reverse, though after a few tries we remembered to turn the wheel in the opposite direction of where we wanted the stern to go. Another thing worth comment is that jet boats of this type have a tendency to be loud, and the Scarab 215 is no different. Its engine noise can become jarring after a while. Still, this isn’t a cruising boat designed for long passages, and most folks won’t be running the Scarab 215 for hours on end at full throttle. Onboard the Scarab 215 oozes quality. The swim platform and other deck areas are topped with gray foam decking, which is comfortably easy on bare feet and uncovered knees. 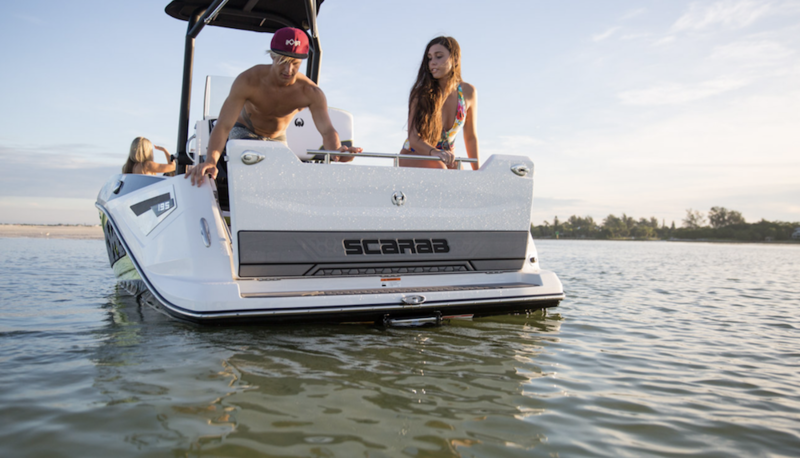 We really liked how Scarab put wet stowage right into the swim platform, too, making retrieving wake boards, skis, and other gear easy from the water. Upholstery and cushioning inside are top notch as is the deck hardware. The main cockpit features a U-shaped lounge at the transom, which can be converted to aft-facing seating at the swim platform by flipping forward one or both swinging seatbacks. Up at the twin consoles we found two very sturdy and relaxing captain’s chairs set behind an effective and elegant wraparound windshield. The bow is comfy, though it’s rather low and we found it occasionally tossed a bit of spray on occupants in a chop. You may have noticed that we didn’t mention a head. It’s not an omission, none of the Scarab 215 models have one. The bow features a sort of “playpen” that can be utilized as a U-shaped lounge or by two folks in forward-facing chaise lounges. At the end of the day we felt as if Scarab has really hit the mark with the 215. It’s fast, nimble, comfortable, and should satisfy many folks looking for a jet boat. 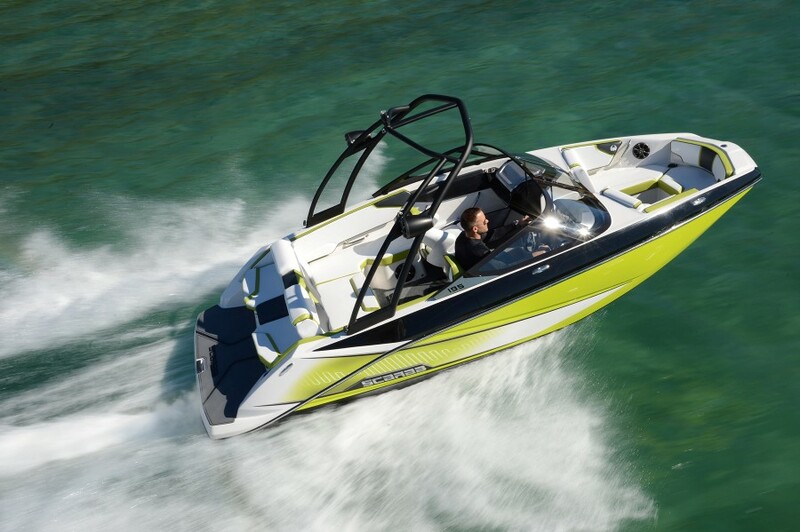 If more serious watersports are your thing or you need a bit more luxury baked in, you can upgrade to the 215 H.O., H.O. Impulse, or Wake edition. Either way, you’re in for a ton of fun. Other Choices: Though it’s a bit larger and more expensive, the Chaparral 243 Vortex should be on your shopping list. On the flip side, the smaller Yamaha AR and SX also provide interesting options. For more information, visit Scarab. See Scarab jet boat listings. 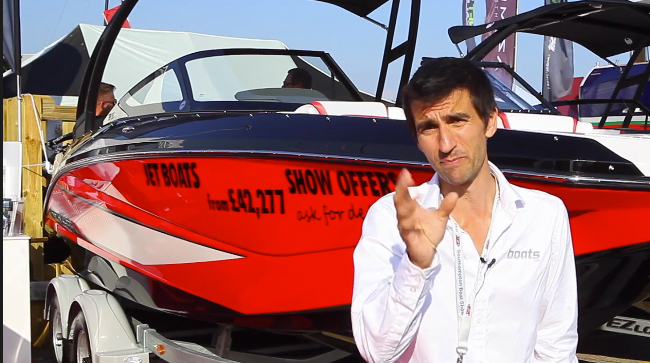 Boating Tips: Should You Choose a Jet Boat?